Sake is, at first glance, a simple creation. The main ingredients are water, rice, koji, and yeast. Pristine and uncomplicated. But things get a bit more involved just beneath the surface. Water is an appropriate analogy of the apparently simple yet inherently complex nature of sake brewing. The popularity of bottled and spring water over the last few years attests to the difficulty of maintaining a pure water supply. A quick discerning sniff of the ordinary tap water of many cities can crinkle the nose of even the most insensitive of dullards, especially when compared with fresh spring or well water. Imagine if the delicate flavor components of sake were to be made to compete with that onslaught. Sake in its completed form is about 80% pure water. Before it arrives at that final manifestation, however, it is exposed to oceanic amounts of water in each step of the brewing process. The rice is washed, rinsed, and soaked before it ever gets close to the steaming process. Water is then added to the fermenting moromi in the tanks at each of the (typically) three "shikomi," or additions of rice, water and koji. Finally, a little water is almost always added at the end to bring the alcohol down from the naturally occurring twenty percent or so to around sixteen percent. All together, the amount of water that goes into a bottle of sake adds up to be more than 30 times the weight of the rice used. It deserves a bit of attention. Water and Earl Most of the traditional sake brewing locations, like Nada (Kobe), Fushimi (Kyoto), Saijo (Hiroshima) and Aizu-Wakamatsu (Fukushima) came into existence partly due to the abundant supply of good water in the region. Chemical analysis was not exactly in its heyday in the 1700's, but the final product told the story, and everyone rushed to set up shop where success had been proven. The most famous example of this is the water that rushes down from Mt. Rokko in Hyogo Prefecture into Nishinomiya and Nada. Known as "Miyamizu," sake made using this water was immensely popular among the elite. This led to the region having more breweries and producing more sake than any other place in Japan, a statistic which still holds true today. Eventually science caught up to intuition and experience and found ways to determine what exactly makes "good water" for sake brewing, as well as what does not. The results of extensive research by sake-brewing research centers, which exist in almost every prefecture, have now become common knowledge to brewers. There are a number of elements whose presence is indispensable, without which certain steps of the brewing process will not proceed smoothly. There are also several things that are only detrimental, and either impede the process or adversely effect the sake in other ways. The baddest hombre of the bunch is iron. Iron will darken the color of sake and adversely affect its taste and fragrance. This happens because it chemically attaches to the center of a normally colorless compound attached to an amino acid produced while the koji mold is being made. Also, as sake ages, the residual sugars react with amino acids present to change the flavor and smell, and the presence of iron hastens this reaction. Manganese plays a different but equally despicable role. When sake is exposed to light, in particular ultraviolet light, manganese promotes a chemical reaction that will discolor and de-luster the appearance of a sake. In direct sunlight, this change can be seen in less than three hours. Although there are others, these are the main two culprits in water that would negate candidacy for sake brewing. Then there are the good guys; elements and compounds whose presence we cannot do without. In particular, potassium, magnesium and phosphoric acid are necessary to aid the propagation of the yeast in the "shubo" (yeast starter), as well as in the proper development of good "koji". If these are not present in sufficient amounts the yeast cells will not multiply as well or as quickly, throwing off the timing off of the entire fermentation so that it can not be properly controlled. One of the problems here is that potassium is water soluble, and can be washed away during the rice washing and soaking processes if the kurabito (or brewery workers) are not careful. A similar hassle exists with phosphoric acid, as it is generally attached to fat and protein molecules. It must be removed from these, and the bonds are broken by enzymes donated by the kind koji, thereby freeing it up to be used by the yeast. This shows how tightly the various aspects of the brewing process are intertwined. To sum up, potassium, magnesium, and phosphoric acid help vigorous yeast propagation and also assist in koji development. Iron and manganese, on the other hand, adversely affect the flavor, aroma, and color of a sake in a relatively short amount of time. Where Do Brewers Get Their Water? Leaving the chemical chicanery behind, where do kura get their water? More of it comes from wells than any other source. The stable temperature of deep well water gives it consistency, although the individual qualities of a well vary with depth and the land. Rivers flowing from the mountains as well as lakes and other bodies of water are also used, but the less-than-positive changes in the environment over the last century or so have rendered many of these useless. Which is not to say this practice is completely obsolete. 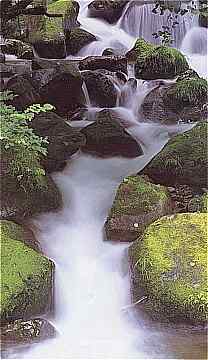 Many kura brag about their region's "meisui" (famous water), insisting that it is one of the secrets of their fine brew. Naturally, water can be chemically altered and synthetically produced to specifications, so many kura take that route. Still others use local tap water, and filter it or alter it as is necessary to fit their needs. As a general classification, water for brewing is often referred to as "kosui" (hard water) or "nansui" (soft water), with several monikers that reside somewhere between those two extremes. Although both kinds of water have the potential to make wonderful sake, the brewing methods are subtly different for each. The famous Miyamizu of Kobe is kosui, whereas nearby Fushimi water in Kyoto is nansui. Both Hiroshima and Fukushima have, in general, soft water. Among sake brewers, water is more often referred to as "tsuyoi mizu" (strong water) and "yowai mizu" (weak water). This refers to how well the water promotes fermentation. And just because the water is "weak" does not by any stretch mean it is not suitable for brewing; it just indicates that the timing of certain steps will be different. Although the correlation is not completely direct, hard water is generally strong water. Lately, in the barrage of information that has come to appear on sake labels, the type of water used in brewing is sometimes listed.